The stories associated with Jewish holidays are well known. They are the stuff of books and movies. However, they are not all just for children at bedtime. They have lessons for everyone who reads and discusses them. The purpose of this section is to mention the most famous and some not so famous, in the hope that you will find new meaning in the stories we all take for granted. On Rosh Hashanah, we read the portion of the Torah that tells the story of the birth of Isaac, and the story of the Akedah, the sacrifice of Isaac, the only child of Abraham. As you recall, Abraham and Sarah were childless for most of their marriage. Finally, in her old age, Sarah conceived, and Isaac was born. The name, Isaac, or Yitzchak in Hebrew, comes from the Hebrew word, l’tzchok, to laugh. Sarah was so dumbfounded to learn she was pregnant, she laughed out loud at the thought that at 90 years old, she was going to give birth. Isaac grew up the cherished son of his parents, so it was a great shock to Abraham when one day G-d instructed him to take his only child, his beloved son, Isaac, over a mountaintop to be sacrificed at an altar. Now, it’s unclear from a cursory reading, to tell who is the hero and who is the villain in this story. Explaining this story to your children may be challenging and will likely bring up very interesting questions that may lead to debate and discussion. Try asking them who they think winds up the hero or the villain. Clearly, G-d could be the villain in this piece for commanding Abraham to kill his only son. Or, maybe it is Abraham, for he seems willing to take his son and sacrifice him to G-d.
Isaac seems obvious in his role as hero, because knowing it or not, he goes with Abraham and is willing to lay down his life. Or, maybe Abraham is the hero for showing his faith and obedience in G-d in such an unmistakable way. And, finally, ask your children if they think the biggest hero of the story might be G-d, for He is the one who stops Abraham, who is about to kill Isaac, and tells him it was only a test and to sacrifice a goat wandering in the bushes instead. This story cannot be taken at face value. There are so many deeper levels to explore. There is a famous midrash which says that at the time of creation, G-d prepared three things for later use: The ram’s horn, the burning bush and the dove that signaled the end of the mabul, the flood that destroyed Noah’s generation. 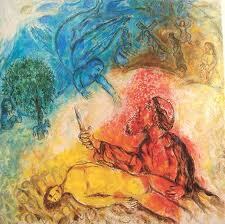 Chazal, our sages, tell us that G-d always prepares the refuah, the cure, before the macah, or suffering. It can also be argued that G-d had no intention of ever allowing Isaac to be sacrificed. Certainly, nowhere in the Jewish tradition is human sacrifice ever mentioned or practiced. One may also debate the fairness of such a test put before a father, but Abraham was no ordinary test subject. Abraham was the first Jew. On his own, he realized that the idols his father, Terach, his family and friends worshipped were statues made of clay. He believed in one G-d and that G-d was as real to Abraham as his own wife and children. When G-d told Abraham to take his wife, his servants, and his cattle, and go to a new country called Canaan, Abraham obeyed unquestioningly. In Abraham’s lifetime, G-d spoke to him and Abraham spoke back. Today, we rely on faith and prayer when talking to G-d. It is our hope that through our observance of the mitzvot and through our daily prayers, that G-d listens and answers us. Maybe that is why the ram’s horn has remained a symbol for the ages. On Rosh Hashanah, when we hear the wail of the shofar, we remember how G-d was merciful to Abraham in sparing Isaac. On Rosh Hashanah, we pray that like Abraham, G-d will spare our lives and the lives of those that we love. A lesser known story we read about every Rosh Hashanah retells the birth of the Prophet Samuel. This story has many parallels to the story of Abraham, Sarah and Isaac. See if after discussing both, you and your children can find them. Like Isaac, Samuel was born to a childless couple, Hannah and Elchanon of Elkanah. Like Abraham, Elchanon had two wives, one who had children and one who did not. Like Sarah, Hannah was the cherished wife, but also the saddest, for it was her greatest disapointment that she was barren. Abraham’s other wife, Hagar, and Elchanon’s other wife, P’ninah, according to the midrash, taunted the childless spouse. Hannah decided to seek help. She went to Elimelech, the Cohen Gadol, or high priest. She made a shvuah, an oath, that if G-d would grant her a child, she would turn him over to the service of G-d. Hannah started to pray. The text says only her lips were moving and no sound was heard. When the High Priest saw her, he thought she was drunk. Hannah told him that she was not drunk, only praying. It is important to note, that it is Hannah’s method of praying that Jews emulate to this day. Before Hannah, people prayed silently. Today, Jews pray by very quietly uttering the words of the praryer. In time, Hannah did give birth, and she named her son, Samuel, Shmuel, for G-d had heard her prayers. Hannah also kept her promise, and when her son was old enough, she brought him to Elimelech so that he could live with him and learn the service of G-d.
On her own, Hannah sacrificed her son to G-d. Not in the physical way that Abraham almost did, but in a way almost as final. In a kind of irony, she gave up her only son as thanks for being granted her only son. Samuel grew up to be one of our greatest prophets and advisers to our kings. He was the last appointed judge over the Jewish people before David was anointed king of Judea. From Hannah, not Sarah, we learn the power of prayer. Sarah never thought she would conceive. She laughed out loud at the mere thought. From Abraham, we learn of a father’s sacrifice and ultimate redemption. From Hannah, we learn of a mother’s sacrifice, but in her case, there was no voice from the heaven telling her to keep her son and sacrifice an animal as thanks instead. What can we learn from these two different, yet similar stories. G-d does not want us to die for our faith, to sacrifice our life here on earth. That was not why we were created. G-d gave us prayer, not because He needs it, but so that we can use it to elevate our life to a higher level.